Jo Klemm, president of the Chairman of Classic Car Friends Club, Winston Gale, CEO and developer of The Riviera Group, Uboljit Thamchob, Riviera Group Marketing Manager, Martin Koller, and representatives from Pattaya Mail, Liqui Moly Thailand, and Farang Magazine as key official sponsors, present 350,000 baht raised at the Pattaya Charity Classic Car Show 2019 to HHNFT Director Radchada Chomjinda and the grateful kids. 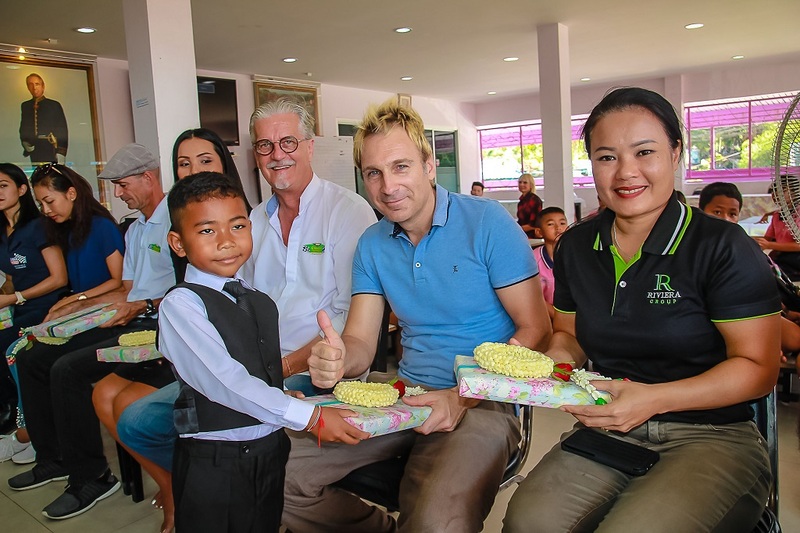 Organizers of the recent Pattaya Charity Classic Car Show formally donated the 350,000 baht raised to the Human Help Network Foundation Thailand. Jo Klemm, president of the Chairman of Classic Car Friends Club, joined sponsor Winston Gale, CEO and developer of The Riviera Group, and other club members and show sponsors in presenting the proceeds of the March 1-3 show at the Asia Hotel to HHNFT Director Radchada Chomjinda Thursday at the charity’s Drop-In Center. Children under the HHNFT’s care welcomed the guests with flower garlands and put on a musical dance show. More than 2,000 people attended the car show, which featured 82 beautiful classic cars and 15 classic motorcycles, including five driven two days from Malaysia. A dapper young master presents garlands to Winston Gale and Riviera Group Marketing Manager Uboljit Thamchob. HHNFT Director Radchada Chomjinda, Asst. Director Siromet Akarapongpanitch and staff explain what the Human Help Network Foundation Thailand does to help local children. The children perform a dance routine for their benefactors.